For our NYE, my husband and I made a tasty desert and admired our creation so much that for a brief moment I saw myself moving to New York and joining the Bon Appetit test kitchen. But alas, I remain in Conroe Texas, where I whip up recipes, taste them and share with the world without arduous testing. Someday, my friends. A delightful combination of creamy lemon and ricotta, smothered in a rich caramel sauce. It melts in your mouth and excites the tastebuds. Total Cooking Time: 1 Hour | Serves 8. Preheat oven to 350º. Whip eggs until they are light in color and frothy, stir in ricotta, sugar and vanilla. Add the zest of one lemon and its juices. Sift salt and flour together and stir into the mixture, careful to avoid lumps. Combine all ingredients until they are smooth and have a slightly thick texture. Pour into prepared pie crust and cook until the center is only slightly jiggly, or 30-40 minutes. Over medium heat, brown the butter. Butter is browned when milk solids cook and create brown specks at the bottom of the pan. Butter should be a light amber. Working quickly once the butter has browned, add slices of peaches all at once and stir gently to avoid breaking peach slices. Cook for 1-2 minutes until peaches are soft. Add brown sugar one tablespoon at a time, until the butter sauce is a dark caramel color. 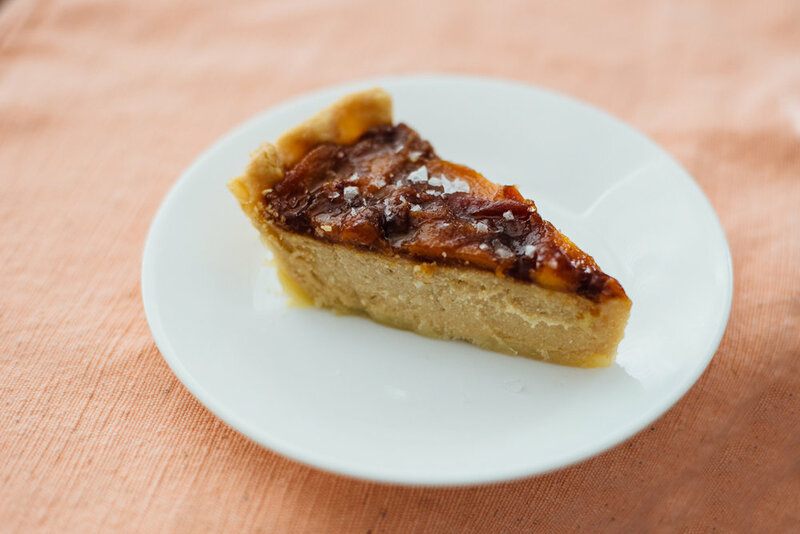 Spread caramel mixture over the lemon ricotta tart after it is removed from the oven, and cool completely. This tart is best served slightly warm, or room temperature. Sprinkle with a generous pinch of sea salt flakes, or give yourself a dollop of creme' fraiche or whipped cream and you are set for a rich and delicious treat to celebrate the new year. Disclaimer: I may receive a commission through the products linked in my posts. All products I share I use every day and believe in. Sign up with your email address to get more recipes from me.